I have an algorithm which generates some cars (quote unquote) and displays them using Graphics. I would like to know if my code is using Random correctly, and if it has any memory leaks. Or if there is anything I did wrong and I should improve. int tires = rand.Next(1, edges.Length + 1); //Tire amount is random from 1 to edge length. Each tire has the position of the corresponding edge. //A car needs tires and a body. Button1 is a button with label "Generate some cars", it generates some cars and puts them in the combo box. This is bad. The old or previous Graphics object needs to be disposed before you create a new one but even so using a global Graphics object is still bad. You should override the OnPaint method and do the drawing there. But not everything is bad. You wrote classes for the car, for the body and tires. Your methods have only a single responsibility each. This is all good. From the design point of view you now should put them in appropriate classes that have a single responsibility too similar to what @chenop suggested in his answer. You're on the right track. I would expect separating the UI interactions, the drawing actions and the generating car actions. 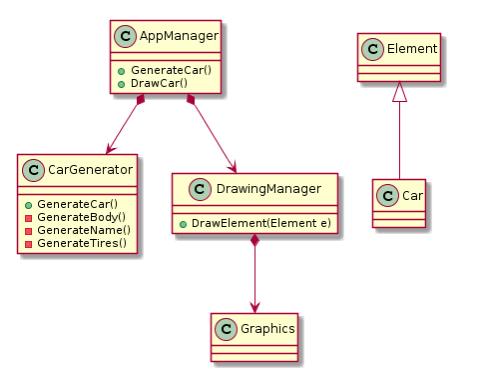 DrawingManager - The class which responsible for drawing something, it is the only class that consume the graphics class. Not the answer you're looking for? Browse other questions tagged c# winforms graphics or ask your own question. Is this a thread-safe implementation of background bitmap generation?